Chris and Natasha Ashton founded Newtown Square-based Fetch, which started Petplan veterinary insurance, in 2003, when they were Wharton students dismayed at their cat's vet bills. From their cat Bodi’s sickness to their son Henry’s birth 17 years later, Chris and Natasha Ashton were the cutest couple in corporate Philadelphia. But now the founders are gone from their joint CEO suite at the pet-friendly Newtown Square headquarters of the company they founded to sell Petplan dog and cat insurance in the U.S. The couple are suing parent company Fetch Inc.'s controlling investors — banking mogul Vernon W. Hill Jr. and billionaire hedge fund investor Steven A. Cohen — for millions the plaintiffs say they are owed since the board took away their co-CEO titles last April, a month after their second son’s birth. The Ashtons’ claims "are without merit and we are confident the matter will be resolved in our favor,” the investors said in a statement. 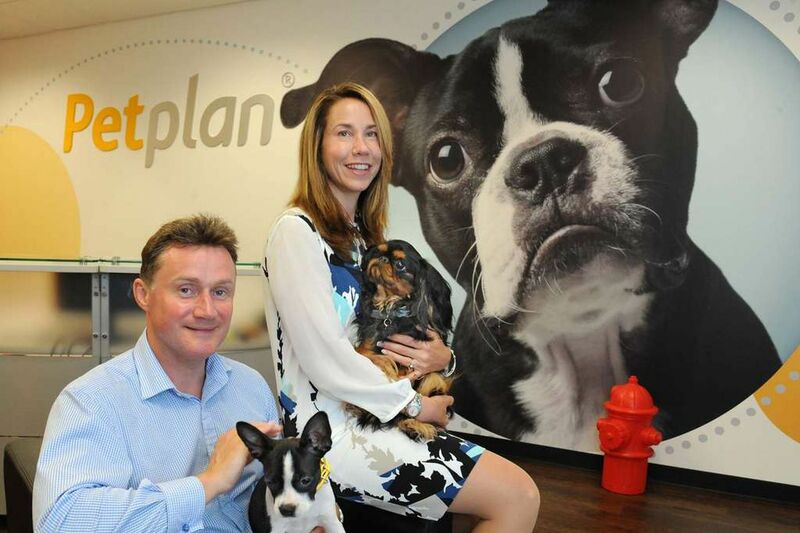 “We are committed to moving forward in the best interest of Petplan, our employees and our policyholders,” under a new CEO, pay-TV veteran Paul Guyardo, who they say has speeded up the company’s lagging growth since the Ashtons left. The Ashtons liked to tell their fairy-tale business story: The former British commando and his wife met at Oxford University, and moved to Philadelphia to get twin MBAs at Wharton. In 2001 their blue point Burmese stopped eating. Shocked by the high price of American veterinary care, they were determined to import British-style pet insurance, won a student business-plan competition, and borrowed to acquire U.S. rights to the Petplan brand. They secured millions from a pair of Dutch brothers, and from fellow Wharton grad Hill, founder of the former Commerce Bancorp and Metro Bank Plc (UK), and his friend Cohen, founder of SAC Capital Advisors and Point72 Asset Management. The investors named the couple co-CEOs. By 2017, sales topped $100 million, and the Ashtons were collecting salaries of $375,000 each, plus benefits, according to their Philadelphia Common Pleas Court lawsuit filed last November against Hill, Cohen’s investment manager Andrew Cohen (no relation), and both men’s investment entities. The Ashtons were “concerned with Mr. Hill’s likely reaction to Natasha’s pregnancy,” they claimed in their lawsuit. They called Hill a man prone to “blatantly and insultingly sexist comments.” But Natasha did send an email announcing the blessed event. Hill summoned her husband to a post-Christmas meeting “without Natasha," where the three director-investors urged Chris to become sole CEO. He resisted. Natasha called, asking “for clarification” Six weeks later, she had her baby. Six weeks after that, in late April, the board stripped the pair of their co-CEO titles. No, it was the Ashtons who broke their contract, Hill’s and Cohen’s lawyers replied in court filings. They said Hill had complained in 2017 that the Ashtons paid themselves $206,000 in “unauthorized” bonuses in 2015 and 2016, potentially a fireable offense. And board members had been dissatisfied with the company’s slow growth in 2016 and 2017, compared with rivals'. Still, while they lost co-CEO titles, their pay and benefits remained. So when they quit, they “materially breached” their contract, and shouldn’t get severance. Plus, the Ashtons “falsely accused” Hill of sexism, making an “impertinent and scandalous” claim. The Ashtons said the bonuses were proper, under a program run by the company’s chief financial officer Terry Malloy. And the couple escrowed the money when Hill complained. But “Fetch never sought to collect” it, preferring to “disingenuously concoct false claims,” their lawyers argued. The Ashtons in their filings also noted that Hill is not just chairman, he’s also a consultant to the pet insurance company, collecting $720,000 last year — almost as much as the two Ashtons’ combined salaries. Judge Lisette Shirdan-Harris has tentatively scheduled the Philadelphia trial for April 2020. A second Ashtons case against the Fetch investors is moving through Delaware Chancery Court, that popular venue for shareholder fights. On March 11, the Ashtons asked Vice Chancellor Kathaleen St. Jude McCormick for an order to stop changes the investors negotiated with insurance underwriter XL Specialty, which they say would cut the pet insurer’s income and threaten “financial disaster.” Though they are no longer CEOs, the Ashtons say they, not the investors, have the right to update Petplan contracts. The heavily redacted filings also say they were close to negotiating a sale to new owners when they lost their titles last year. Hill is no stranger to struggles for control. He lost his job running Commerce Bancorp in 2006, after a dispute with federal bank examiners over his family’s companies that did business with the bank. In 2017 he settled a years-long legal standoff against Saladworks founder John Scardapane in a deal that forced both men out of the company. The Chancery case, which could give the Ashtons leverage, is scheduled for a trial April 22, and the Philadelphia case, for their severance, could come a year later. Little Henry could be old enough to help walk the Ashtons’ dogs by the time his parents know whether their departure made them millionaires, or just another immigrant couple, looking for a new start.